When considering the brand or type of urinary catheter you’ll be using, the eyelets might not be the first thing you think of as an important feature. As a matter of fact, the quality, size, and placement of the eyelets can add or detract greatly from your overall catheterization experience. We hope to offer you a more detailed explanation of why that is, as well as the possible options that are available so that you, together with your prescribing health professional, can make the right decision on what intermittent catheter may work best for you. The eyelets of a catheter are the small holes located typically on or around the insertion tip of an intermittent catheter. These are placed here so that when the catheter enters the bladder, the urine can enter the passage of the catheter tube and then drain out accordingly. One of the first and perhaps most obvious differences between intermittent catheter eyelets would be how the eyelets are created during the manufacturing process. 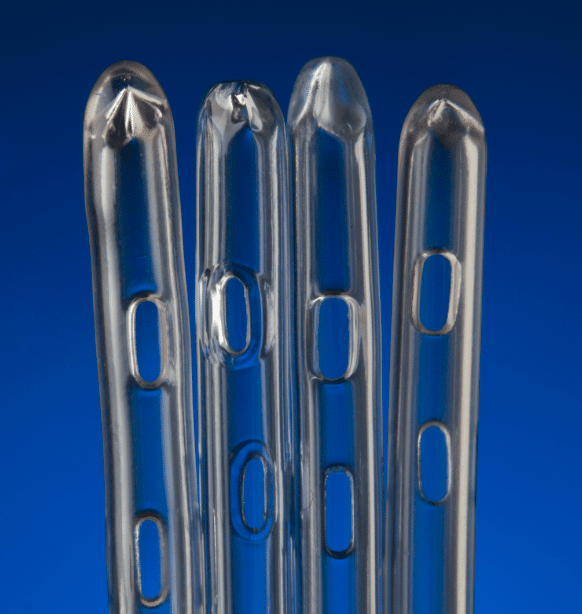 One way to create a catheter eyelet is by literally punching a hole in the material, sometimes called “cold-punching.” While this will create eyelets that do their intended job, some catheter-users find that punched eyelets are a little rougher and the edges can create some discomfort as the catheter moves through their urethra. Many catheter products being manufactured today have eyelets that are polished. Polishing the holes makes the edges much smoother, which allows for a more comfortable catheterization with less friction. The catheter eyelets can vary from brand to brand in terms of shape and size. Larger eyelets may allow urine to drain a little faster, as will having two or more eyelets versus just one. Smaller or fewer eyelets will allow the urine to flow a little more slowly from one’s bladder. However, this also depends upon the brand itself, as some catheter types may also have more narrow interior passages due to their unique layering, which could also account for slower drainage. 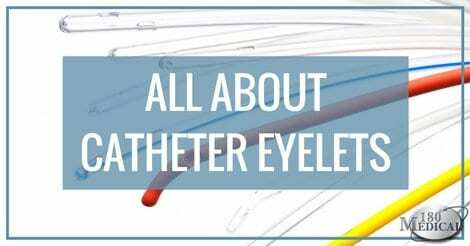 Another point to take into consideration is that the shape of the catheter eyelets may also play a role in how comfortable a catheter may feel. In an in vitro study in 2014, researchers looked at how eyelet shape affects the surface tissue of the urethra. It was determined that wider drainage eyelets allowed more tissue to dip into the hole, which may create a feeling of discomfort, irritation, or friction. This might be another aspect to consider when looking at your catheter options. There are many intermittent catheter brands and types out there. We know that the wide selection can be overwhelming, especially when you’re learning to self-cath for the first time. And of course, there is no one catheter brand that works best for everyone. We have a wide variety of intermittent catheters for men, women, and children from all of the top catheter brands available today, and since we specialize in catheters, we know our business from top to bottom. If you find your current catheter is not as comfortable as you feel it should be, or if you are ready to try out some alternate products, feel free to contact us to speak with of our highly-trained, friendly specialists today.